Psychological identity formation mediates our visceral sense of self through the reflecting chamber of the external world. 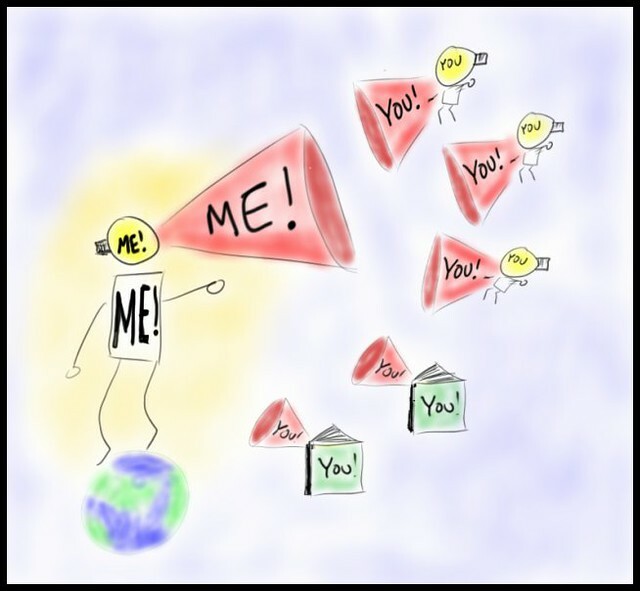 As the image above depicts, there is an ongoing interplay between our projection of self to others and the affirming or contradictory stories others project about us. The dance of identity construction is impacted not just by personally directed attribution, but also by ambient cultural messages related to race, gender, class, etc. Over the course of life, the initially flexible and fluid potential of identity becomes constrained by an accumulating legacy of personal history. Both our sense of self and the way we are perceived within our social circles become more fixed and less amenable to change. Although it is certainly possible to recreate oneself at any point in life, it is not simply a matter of acting to modify one's own behavior. It is very difficult to develop a "new you" when friends, family and colleagues continue to respond to the "old you" they are used to. This is why people who leave their hometown to forge new lives can quickly fall into old patterns when they come home for the holidays. The creation of a pseudonymous avatarian identity can allow one to transcend many of the psychological, cultural and interpersonal constraints described above. You can not merely leave your hometown behind, but also escape the socially defined feedback and presumptions associated with physical form, nationality, economic status, etc., including those we have internalized. I suspect that the increasing presence and activity of avatar-identified participants in social networks reflects the unique roles those vehicles play in the identity-formation process of virtual personas. I'll hack more into the underlying processess later this week. What are your thoughts about the personal identity as it is perceived by others, as distinct to the personal identity as it is perceived by ourselves? Is there actually a distinction between the two, or are both of them fractured and mistaken views of a self-consistent entity? Or am I excluding too much middle? Yes, I couldn't agree more, Botgirl. This is the great gift of Virtual Worlds. I would say Tateru that the interplay of the two is what forms us, like a social feedback loop. Maybe a heightened feedback is what we need in our otherwise rather insular existence. Tateru: The term "identity" has quite a few meanings. The meaning I am referring to is "the mental model we use psychologically to represent ourself and others." Of simply put, "How I see myself and how others see me." sororNishi: It's a fine line to be both steadfast in our own view of who we are while being open to external evidence to the contrary. One sad example are the people who audition for shows like American Idol who truly believe they are gifted singers, but reject the judge's feedback that they can't carry a tune. This can also work in the opposite direction when someone with a great talent has so much low self-esteem that they can not perceive it. I find it very enlightening when people share very strong general opinions about the qualities of other people. Comments like "Oh, people will always try to stab you in the back." Or "Love is what motivates everyone." These general opinions of others always seem to tell me more about the speaker's own identity than anything else. Pathfinder: Damn. I started a really pithy reply to your comment and ending up writing a blog post. Oh yes, it's so hard to change who you are because people react to you in the same way as they always did. But a very wise friend of mine taught me that the way to change OTHER people's behavior is to change the way you act/react toward those people. *grin* I am so sure YOU know that too. So yes, it's difficult. BUT.... it can be done. And I did it. And while I started that process before I ever found SL, SL certainly helped my ability to do so. "The creation of a pseudonymous avatarian identity can allow one to transcend many of the psychological, cultural and interpersonal constraints described above." Reinventing oneself in a virtual world may be harder than it looks. Johnny: That study actually replicated something I did back in May of 2008 via my blog.. I think the reasons there were no differences in the results is that they did not give it enough time. The emergence of a new personality is something that doesn't happen through a week or two of virtual world visits. I'm glad you reminded me of that study. I think I'll post in more detail later this week. Yes, the JVWR paper references your study. I think they do make a fair criticism that you had biased the outcome by inviting the participants to consider how their avatars differed from their non-virtual selves, which will have influenced the way they filled out the questionnaire. I think the thing to note about the Dutch work is that the vast majority of their subjects were not actually SL residents as such; they were people who had only signed up to SL for the purposes of the study, and so might be expected to be different from people who had chosen to create avatars for their own reasons. Ideally one would want to replicate the study, but with a population of long-term residents. The difficulty would be finding a group who had already taken a suitable personality test that could be re-administered inworld. One would need to use university or army records, or something, and you really need to be an institutional researcher to get access to that sort of thing. There would also be the problem of persuading residents to reveal their real identities so that the results could be cross-checked - the people willing to do this would probably not be representative of the population as a whole, as, I would think, they would be the ones who were more secure in their real-life personas, and thus the least likely to construct a virtual personality that was significantly different.